Right, full disclosure time. My first impulse, after buying the tickets to the special Official Sneak Preview of the upcoming film Serenity, was to wander to my closet and figure out what I was going to wear. I had eight days until the screening, and there was no earthly reason why I should want to look nice or special or noticeable… But, y’see, the überfans of Serenity and its progenitor, the television show Firefly, are called “Browncoats”, for reasons important only to those who care. I’m a big trenchcoat wearer, but I don’t own a duster, and I certainly don’t own a brown oilskin, which would be the preferred garb of a die-hard Browncoat. I didn’t and don’t particularly think of myself as a die-hard, but the truth is that my first thought was to consider if I could find a duster in time for the film and, if not, what I could scrounge from my closet that would be a suitable substitute. This is how the nerding begins. I scoff at Star Wars fans and Trekkies and Trekkers and even Rocky Horror Picture Show devotées. I’m too cool for school, and I think that a minimalist nod in one’s wardrobe that acknowledges that one knows the scene but maintains a detached distance from it is the best dress code. Never wear a Name shirt to a Name concert, but a slim cloisonné pin from a band in the same scene or on the same indy label… now that’s slick. Hip, but superior: that’s the way one carries oneself at a public gathering of fans. So I found myself surprised to be, well, almost dressing up in costume in my excitement for this film. I was able to justify it by using nothing that I wouldn’t have casually worn with anything else in my wardrobe on any given day. But, truthfully, I garbed up for this event, and I’m a little embarrassed at how slippery that slope really is. Luckily the brakes on said slope were put on by the presence of the other audience members, who weren’t as appalling as the average comic book convention, but still represented a cross-section of genetic slovenliness that should shame both Mendel and God. And while I will certainly watch any downloadable videos or special features that have footage shot by the documentary and promotional crew on site, and I will look for myself in the crowd, I was a little relieved not to be interviewed or featured, as such a prominent position would mean that I Belong more than I’d prefer to admit. I’m just not fan enough. A young lad snuck around a couple of rows to try and move more quickly through the line to receive autographs from the graceful attending stars, Morena Baccarin and Sean Maher (see image at left), and ended up standing behind me. He attempted to engage in conversation about the success of the film, and I could tell by his plaintive, reedy voice that a withering stare was not going to dispell him. I considered turning and frankly informing him that not only did I not go to the cinema to meet people, but that I especially didn’t talk to overgrown juveniles whose vocal pitch and tone indicated a severe lack of human, non-virtual interaction… but, well, it seemed slightly harsher than the occasion merited. However, he did compliment me on my attire, and I think I did rather well not to immediately strip down and set it ablaze. However, despite this and the most minimal of other disproprtionately memorable experiences, it was a good audience, an audience that listened to the film and drank it in with the appropriate attention. It meant that the theatre was quiet, because they were fans, and they wanted to get every morsel of dialogue and plot and information that they could. And it was lovely to be in a cinema with patrons so attentive and respectful. When they got home to the internet, of course, the talk turned bitter. Plot events conspired in directions that made sense dramatically, but may seem as a betrayal to those who care more about characters with whom they empathise than the merits of the well-told story and its needs and structures. Too bad. It’s a dynamite movie, real solid summer entertainment with good storytelling, inventive filmmaking, and impressive visuals. Early buzz said that it was just a longer episode of Firefly, and the negative response by some of the fans is making the fans that couldn’t go to the screenings nervous. I hope the second series of pre-release screenings on May 29th (an odd promotional decision, I feel) does something to counter the bad vibes being engendered. I left the cinema more satisfied theatrically than I had since The Incredibles. 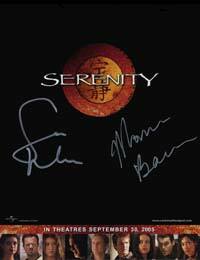 So a brief note for those who have read the hints of the doubters, who never saw the source TV show, and for those who are slightly allergic to anything associated with the Buffy the Vampire Slayer movement: Serenity is a marvelous piece of sci-fi cinema. It’s funny, charming, and has some excellent visuals, and some breathtaking suspense. Universal has a film that could easily go toe-to-toe with any summer blockbuster, but it’s not going to be in theatres until September 30th, when the season has cooled down. Hopefully this will allow Serenity not to get chased out by the newer, bigger release and will give you enough room to go see it. Give it a whirl. I strongly recommend it.